Sonja is ill-pleased to discover that the new war-mongering king of Hyrkania is a former ally - a merchant named Savas who once hired her as a guard. She is even less-pleased to learn that everything he has done was part of a misguided attempt to win her heart and that he would have her as his queen... one way or the other! 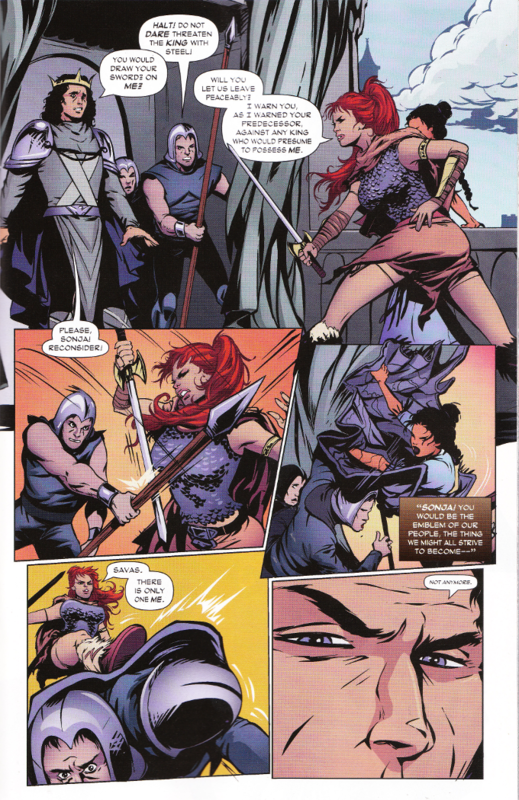 With Red Sonja #3, Marguerite Bennett does more than merely pay tribute to the first Red Sonja solo story, which saw a power-mad king try and claim Sonja after deciding she'd better serve him decorating his harem than leading his army. Bennett's story here is a rather neat metaphor for Sonja's treatment by long-time sword-and-sorcery fans who disliked Gail Simone's recent revamp, with King Savas playing the role of the angered fanboy whose image of Sonja as a pure and perfect goddess has been spoiled by the reality of who Sonja is. Metatextual analysis aside, this issue is also a damn good action story and Bennett does a masterful job of developing the supporting players, with Raka - a hunter and another former lover of Sonja - being particularly noteworthy as a counterpoint to Savas' obsession. Aneke's artwork for the issue equals Bennett's script. I regret that I cannot show you some of the beautiful two-page spreads this issue contains, due to the size of my scanner. Suffice it to say that Aneke is a great artist and the beauty of her work is matched only by her skills in telling a story visually and blocking a fight scene. The colorists for this issue - Jorge Sutil and Morgan Hickman - deserve praise for working together so seamlessly, you would never know that one artist did not do the color art for this issue. And Erica Schultz delivers some stunning-looking lettering.